Years ago when Mister Soandso and I bought our current house, my in-laws gave us a step stool as a house warming gift. Considering I am 5’2″, it was a perfect gift for me. Everything in my house is too tall for me. Well, not everything, but lots and lots of shelves and cupboards are. So the step stool, which folds for compact storage, sits in my kitchen, always unfolded and at the ready for me to grab. In it’s unfolded and at-the-ready state, it makes a handy place to sit and tie shoes, set a bag of groceries, or, if you’re particularly hot and sweaty, drink a glass of gatorade after a run. It’s had paint dripped on it, coffee spilled on it, jello melted on it. It is one of the items in my house that gets used every single day. And usually by me. It sits just outside of a major foot traffic pattern in my house–in the kitchen, next to the refrigerator. There is something about sitting on a stool in a traffic zone in one’s house; folks find you. Usually that folk is my dog so the lacing or unlacing of my shoes is accompanied by a wet nose to my ear or cheek. But sometimes that folk is one of my cats brushing up against my leg, reminding me that she owns me. And sometimes it is even one of my less furry kids or husband. Yesterday was not a good day for me. In fact, lately I have had a whole string of not so great days; however, that is not the soul of this story. But it is a necessary kernel at the story’s start. Yesterday was not a good day for me. The kind of not so good day that leads to crying the ugly cry with great big soul-wracking sobs, but when someone asks what’s wrong, there is no great big reason. There are only hundreds of teeny-tiny paper cut-sized reasons that burn and ache. Finally it was just too much. And I walked over to the stool and sat there, head in my arms, folded on top of my bent knees. I was small, but my hurt was big. And so I started to cry, quietly at first because I didn’t want my kids to hear me. After all, I am the adult. I’m supposed to be bigger than a bad day. As if by being quiet about my sadness would make it less scary to them, when in reality that’s not how it works. But when a heart hurts, it can’t always be quiet and so my silent tears turned into sobs. Then a small arm wrapped itself around my shoulders and hugged me to a thin little torso. It was Littlest. Hugging me, without speaking to me. He was reading something and not looking at me; just standing next to me and reminding me that being sad doesn’t always have to be done in silence and in isolation. And that comfort doesn’t need words, just another’s presence. I am thankful for that small stool in my kitchen. Not only does it allow me to reach spaces too tall, but also allows me to get small enough to let my children be my strength every once in awhile. *This post was actually started on Wednesday. Thursday was a better day. Not a great day, but a better day. Perhaps today I’d better sit down on my stool and make myself available to whichever “folk” in my house wanders by and finds me at a more accessible level. Perhaps everyone needs to sit on a step stool and see what happens. This entry was posted in Front Page, parenting and tagged coping with depression, depression, parenting, step stools by kristina. Bookmark the permalink. 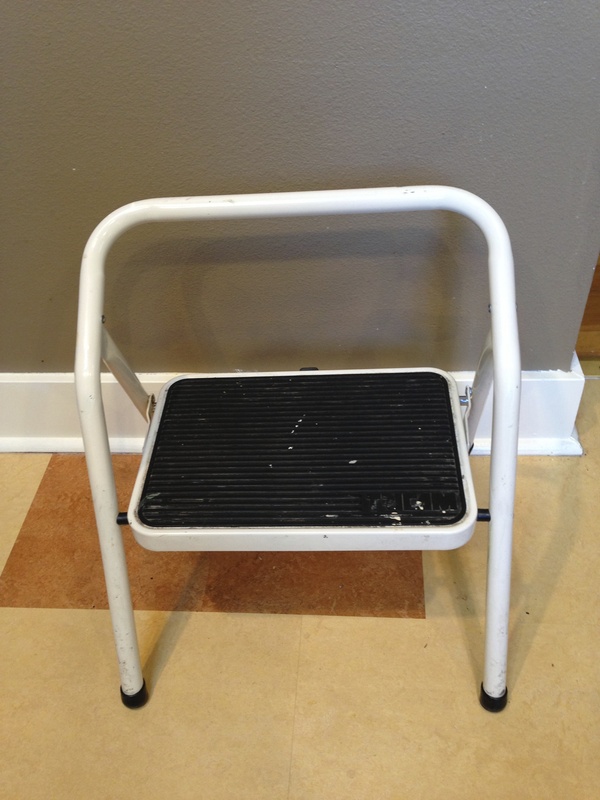 Yes, step stools are good, as many things are, that have more than one good purpose. A good day for this.